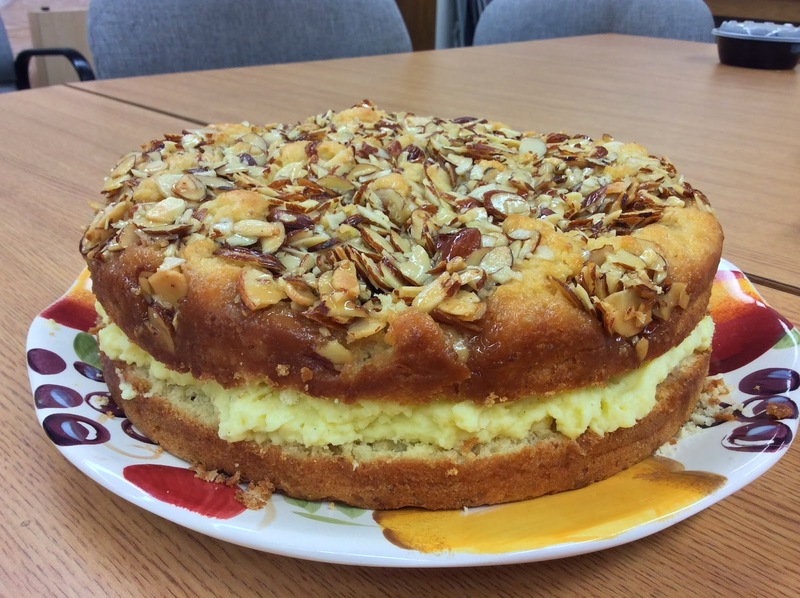 Several months ago, I came across this SmittenKitchen recipe for a "Bee Sting Cake," i.e. a Bienenstich: a yeasted cake with vanilla pastry cream filling and honey almond caramel topping. I immediately thought, "I have to make this!!!" and started thinking about a suitable occasion for the endeavor, since a cake this attractive and attractive-sounding obviously deserves both sufficient time to make it properly and an enthusiastic audience for the consumption (especially as this cake doesn't have a long shelf life). Baking/science buddy Daniel and I agreed that my birthday would be appropriate, and so the Bienenstich recipe stayed bookmarked until a couple weeks ago. This SmittenKitchen recipe, just as I expect, was extremely reliable. In the late afternoon of the appointed baking day, I started by making a doubled batch of the vanilla pastry cream, with the goal of achieving a 1:1:1 ratio of cake:filling:cake. I had ordered vanilla beans on Amazon, and the scraped-out bean was so wonderfully fragrant as the pastry cream cooked. Once it was chilling in the fridge, Daniel had arrived with the necessary packet of instant yeast, and Dan and Julia had arrived with an enthusiasm for wine and chocolate, we moved on to cake mixing. The honey caramel topping came together easily on the stovetop during the first cake batter rise. We didn't notice too much of a volume expansion after the two rising steps, but as you can see from the final product, there was plenty of height increase in the oven, with gorgeous browning. The next morning we constructed the cake, slicing the single layer horizontally and then dolloping the thick pastry cream in between (after being refrigerated overnight, the custard was quite firm, but softened into a reasonably spreadable consistency after some vigorous stirring). 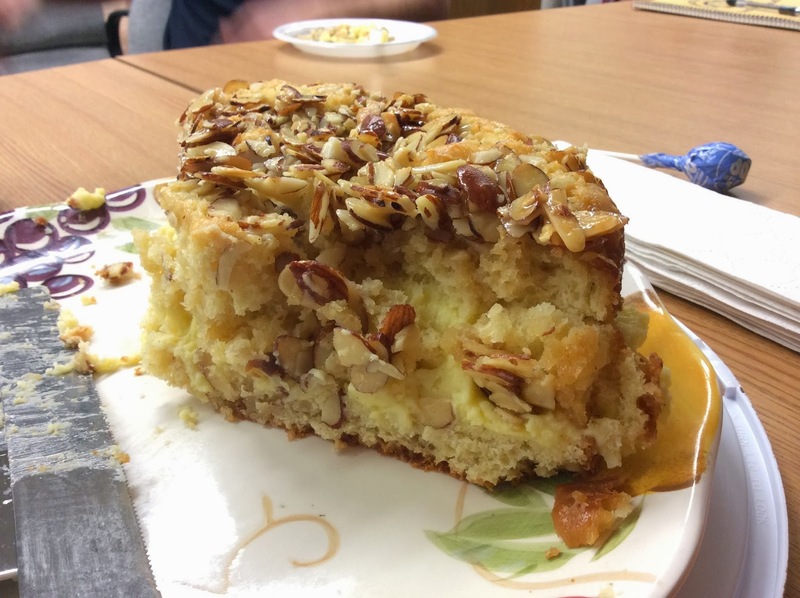 The cake was enjoyed with approval during lab meeting, and Julia later gave it her German stamp of approval. This was certainly one of my favorite cakes that I've ever baked, and I'll definitely make this again! I think the best bites combine a little cake, some pastry cream, and some of the heavenly topping. That said, I will also admit that the cake part was a little bit dry this time - Daniel suggested that next time it should be baked on the top rack instead of the bottom rack, and probably for a little less time - but fortunately with the rich pastry cream filling, everyone still thought it was delicious. In other news, which I expect anyone who is reading this to have already heard, Andrew and I got engaged recently. We're happily looking ahead to a lifetime of shared meals and adventures!